OneFIT Medical was created in 2011 in Besançon, in the Incubator of Innovative Companies of Franche-Comté. The objective was to provide patient specific solutions for orthopaedic surgery. The initial project was led by Sébastien HENRY, expert in orthopedics thanks to his experience with market leaders and his involvement in the development of Computer Assisted Orthopaedic Surgery. Following its success, in 2013 oneFIT medical became a subsidiary of the EOS imaging Group, an international group specialized in innovative imaging and software solutions for osteo-articular care and orthopaedic surgery. Our customers are at the heart of our business. We are there to anticipate and respond to their needs with innovative solutions. Our commitment is to satisfy surgeons and ensure patient safety by providing simple, reliable and accurate tools based on 3D clinical parameters. oneFIT medical currently has 26 people with diverse backgrounds who combine their skills in biomedical, mechanical, computer, image processing, electronics and quality & regulatory affairs to design and market innovative solutions for orthopaedic surgery. oneFIT medical also relies on the advice of orthopaedic surgeons and experienced industry leaders. 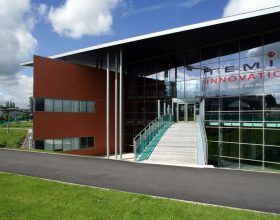 It has also developed partnerships with the three engineering schools in Franche-Comté: ISIFC, UTBM, ENSMM. oneFIT medical has implemented a quality management system in order to market medical devices that comply with regulatory and normative requirements. The company is ISO 13485 certified and its medical devices are developed in accordance with 93/42/2007 Directive.